Set in the high-pressure world of a Chicago TV newsroom, award-winning author Denise Hunter brings to life a heartwarming story of love and pain, desperate choices with dire consequences, and honesty and redemption. Paula Landin-Cohen, an investigative reporter, feels like a fish out of water in the small town of Jackson Hole, Wyoming. Then she’s offered her dream job, as a TV reporter in Chicago. There is so much to gain and so much to lose…including the only man she’s ever loved. Linn Caldwell has made a lot of mistakes—bad mistakes. She can never forgive herself for all the pain she’s caused others. How can she dare to get close to anyone again? What will happen if Paula and Linn’s secrets are revealed? Will the men they love ever be able to forgive them? 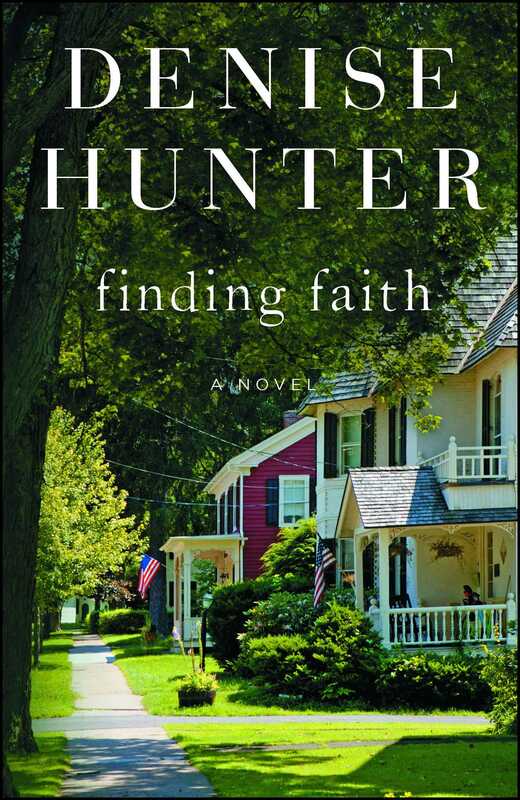 Finding Faith is the third novel in the New Heights series, after Mending Places and Saving Grace. “I’m ready to go,” Paula Landin-Cohen called to her husband, David, as she snapped the latches on her suitcase. The house rang with a familiar silence. She checked the bag for her boarding pass and driver’s license, then hefted the suitcase down the curved staircase, eying the bank of windows on the front of the house. December had blown into Jackson Hole, Wyoming, with cold, biting winds and at least a foot of snow. Chicago’s weather would be no better, but just the thought of the big city left her feeling as though she could soar there without benefit of Delta. As she had the past few months, she pushed aside the bitter memory of her first visit there and focused on her future. Setting her suitcase by the door, she checked her Movado. “David, we have to go.” Her voice echoed up the vaulted ceiling and through the cavernous kitchen, but this time drew a reply. “Fine,” he called—from the office, she thought. OK, not the tone she hoped for, but at least he was talking to her today. She grabbed her Burberry coat from the closet and wondered if she should take her warmest one too. Fashion overruling practicality, she closed the door just in time to catch David’s hand. “Do you mind?” he said. She backed away, ignoring his snippy tone. She wasn’t going to let him ruin this for her. She checked her bag again for the boarding pass and license. She was being compulsive, but she couldn’t let anything go wrong with this flight. She went through the list of things she’d need over the coming week. Had she packed her tape recorders? Before she could panic, she remembered sliding them into her briefcase. David stepped around her in his charcoal, woolen coat, picked up her suitcase, and walked out the door. Paula turned on the threshold and gazed at her home. Sweeper marks striped the beige carpet, running parallel across the expanse of the great room like yard lines on a football field. Her socks from yesterday lay in two distinct balls by the sofa. She turned the lock on the doorknob and shut the door behind her. David placed the suitcase in the rear compartment of the Cadillac Escalade and pushed his trendy glasses up on the bridge of his nose in a movement as familiar to her as the smell of her own home. So familiar that she rarely noticed it unless she was away for several days. She wouldn’t see David push his glasses up, smell his spicy cologne, or watch him squint over the Wall Street Journal for six days. He opened the car door for her, and she slipped inside before he clicked it shut. In spite of their problems, in spite of his relentless blaming and silent treatment, she didn’t want to part this way. Not now, when she was about to do the most exciting thing of her life. She wanted someone to share it with. Someone to be happy for her. Someone to cheer her on back home. Heaven knew her family wasn’t doing that. David slid in behind the wheel and started the vehicle. His movements were sure and precise. Another man’s motions would reveal his anger, but not David’s. “Well,” she said, “at least you’ll be able to keep the house clean this week.” She delivered the line with a hint of humor, planted there in hopes of coaxing him from his disagreeable mood. She cocked her head the tiniest bit so she could watch him from her peripheral vision. When his face gave nothing away, she almost wondered if she’d spoken the words aloud at all. Paula turned forward and stared out her window. It was fine with her if David wanted to leave things this way. She could do this alone. She was a grown woman. They headed up Snow King Avenue toward the Snow King Resort. Already a few dedicated skiers swooped down the slopes on this lazy Sunday morning. She consulted her watch again. Her parents would be getting up for church about now—her mom boiling water for that wretched cup of instant coffee. Hanna and Gram would be making breakfast for the guests of Higher Grounds Mountain Lodge while Micah shoveled the two inches of snow that had fallen overnight. Natalie would be scurrying to get breakfast ready for Taylor and Alex after an undoubtedly sleepless night with her adopted newborn, Grace. Her stomach tightened at that one. She squinted out the front windshield, up Cache Street, the road that would take her out of there. They were making good time. All the tourists had evidently stayed out too late drinking to do anything more than loll in bed. As they crossed the line that demarked the edge of Jackson Hole, Paula almost expected the raucous blowing of party horns. She’d waited all her life to exit this miserable little hole in the middle of nowhere, and today was the beginning of that dream. But there were no party horns. She wished the radio were on so she didn’t feel as if she was about to choke on the silence. She struggled to think of something to say. She, whose words usually came easily and flawlessly. “Your clothes should be ready at the cleaners by five tomorrow,” she said. It was lame, unnecessary even, since David knew very well when his clothes would be ready. At least she was trying. But he sat beside her as cold as a mountain glacier. Couldn’t he at least grunt? Even when she’d come home two days earlier with her auburn hair straightened, he hadn’t so much as glanced her direction. Of course, having her natural curls pulled straight would have bothered him at one time. Now the stiff set of his shoulders made her wonder if he was ever going to thaw. This is Paula Landin-Cohen, reporting from inside an SUV, where a man is attempting to freeze his wife with the cold vapors emanating from his body. Join us at eleven, and we’ll give you all the details on this story. They passed the Elk Refuge, but all Paula saw was acres of snow behind the fence. She looked at her watch again. “You’ve got plenty of time,” David said. She didn’t know whether to be thankful for his first voluntary words or peeved at his tone. She decided on the latter. He’d done nothing but snub her for months, and for what? She was innocent, and he was too stubborn to believe it. Her last word rang out in the car like an echo across Granite Canyon. At least they were talking. OK, arguing, but it was better than the silence. He had no right to deny her this opportunity or to make her feel guilty about leaving. He made decisions without her approval. Why should she have to get his? He turned the car into the airport, and she realized this was it. They were parting as enemies on the biggest week of her life. Why had she imagined calling him on Monday night from Chicago and sharing everything that had happened? There was no reason to call home. She would go back to her apartment after work tomorrow with nothing to greet her except silence. David pulled the vehicle up to the building and got out. Paula waited on the curb as he lifted the suitcase out and set it at her feet. He straightened and looked her in the eye for the first time in weeks. Face-to-face, they stood closer than they had since that day when everything had changed. Was he regretting his harsh tone? Their breaths expelled in cold puffs, mingling in a dance more intimate than anything they’d done together in a very long time. She had a sudden memory of their first kiss . . . It was their third date. She was teaching him to ski at Snow King, teaching him how to snowplow to control his speed, when the tips of his skis crossed and he went down. She snowplowed to a stop, laughing. They spent the whole day laughing. But when she saw he wasn’t moving, her laughter stopped. “David?” She sidestepped up to him, kicked off her skis, and sank onto her knees. Reaching for her, he suddenly pulled her down on top of him. Bundled in so much clothing, he felt like a big, cuddly, teddy bear under her. His eyes sparkled with laughter. “That was not nice,” she said. “It worked, though.” His glasses were slightly cockeyed. The stirring in Paula’s stomach felt right and wonderful. As his grin melted away, the look in his eyes could have melted the snow around them. She went warm all over in spite of the cold temperature. Their winter breath met and blended together. He cupped her face and pulled her toward him until their lips met. The cold tone yanked her from the memory. The words cut deeply. He was so wrong about her. So wrong about all of it. When would he believe her? What did she have to do to prove it wasn’t true? He made her feel somehow guilty, like a little girl sitting in a principal’s office. Yes, the words hurt, but she didn’t allow a trace of it to show on her face. It wouldn’t have mattered if she had, since David was walking away. Walking toward his side of the SUV. Paula picked up her suitcase and walked toward the airport door. Denise Hunter is the internationally bestselling author of more than twenty-five books, including A December Bride and The Convenient Groom, which have been adapted into original Hallmark Channel movies. She has won The Holt Medallion Award, The Reader’s Choice Award, The Carol Award, The Foreword Book of the Year Award, and is a RITA finalist. When Denise isn’t orchestrating love lives on the written page, she enjoys traveling with her family, drinking green tea, and playing drums. Denise makes her home in Indiana where she and her husband are rapidly approaching an empty nest. You can learn more about Denise through her website DeniseHunterBooks.com or by visiting her Facebook page at Facebook.com/AuthorDeniseHunter.